Lineal heavyweight champion Tyson Fury 26-0 (19) has lashed out at local rival and unified heavyweight champion Anthony Joshua 21-0 (20) labelling him an “idiot” and saying he is “afraid of his own shadow”. His comments come after fight negotiations between Joshua and WBC heavyweight champion Deontay Wilder 40-0 (39) of the USA collapsed, with the self-proclaimed “Gypsy King” insisting he is prepared to face the American in his own backyard to salvage Great Britain’s fighting reputation. Fury, who is set to face former world title challenger Francesco Pianeta 35-4-1 (21) on the undercard of Carl Frampton versus Luke Jackson at Belfast’s Windsor Park this Saturday, has been linked to a fight with Wilder in December providing he gets through this weekend’s bout unscathed. 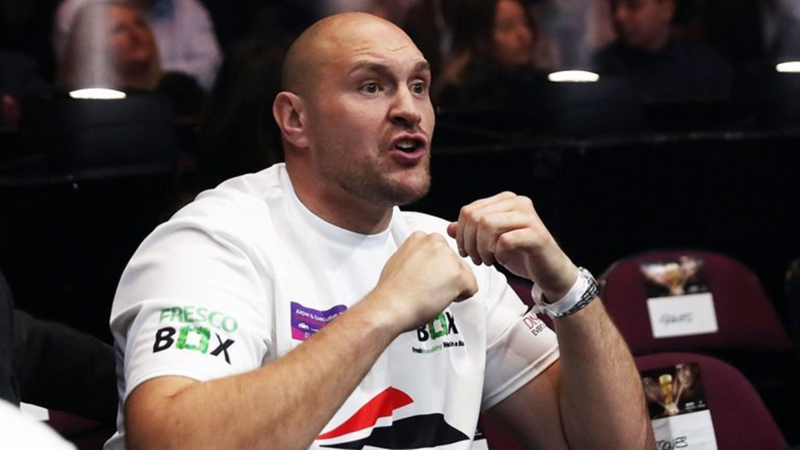 “Whether I’m ready or not, I’m doing the fight with Wilder for British boxing, to take the shame away from it because we’ve got one idiot [Joshua] who is chiselled out of stone who is afraid of his own shadow,” Fury told The Telegraph. “He wouldn’t take the fight with Wilder and has made British boxing a laughing stock. If he’s a fighting man, he should have taken the fight. He didn’t so I have to step in. I’m not afraid to fight any man in any backyard. “I showed that in Germany, Canada, Ireland. Everywhere I’ve ever been, I’ve had to go over and beat their champions. And that’s what I do best. I beat their bums. The Pianeta fight will by Fury’s second after a two-and-a-half year layoff to deal with drug and mental health issues. He returned in June to stop Albanian cruiserweight Sefer Seferi in four uninspiring rounds. Joshua returns to action at Wembley Stadium next month when he takes on Russian veteran Alexander Povetkin 34-1 (24) in defence of his IBF, WBA and WBO world heavyweight titles.